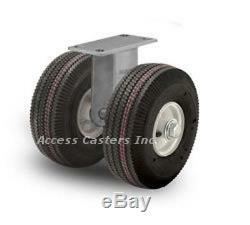 21PN295R 21 Dual Wheel Pneumatic Heavy Duty Rigid Plate Caster 4840 lb Capacity. 21PN295R 21 Dual Wheel Rigid Caster. Two 6.90/9 pneumatic wheels with tapered bearings. 8-1/2" x 8-1/2" top plate. 7" x 7" Bolt Hole Pattern for 5/8 mounting bolts. Visit Access Casters' About Me. We assume no liability for lost profit, incidental, or consquential damages due to delay, factory error, or product failure. The item "21PN295R 21 Dual Wheel Pneumatic Heavy Duty Rigid Plate Caster 4840 lb Capacity" is in sale since Monday, June 19, 2017. This item is in the category "Business & Industrial\Material Handling\Casters & Wheels\Plate Casters". The seller is "jkcasters1" and is located in Chicago, Illinois.